Hawthorne Inn & Conference Center, located in the heart of downtown Winston-Salem and is 29 miles, or 32 minutes drive away from Greensboro North Carolina. We are 6 minutes away from Wake Forest Baptist Medical Center, 3 minutes from Historical Old Salem, and 4 minutes from the acclaimed restaurant row. Within a short 12 minute drive, you will find the Lawrence Joel Veterans Memorial Coliseum. Hawthorne Inn & Conference Center is a 5-minute drive to the University of North Carolina School of the Arts, 5 minutes from the Winston-Salem State University, 10 minutes from Wake Forest University, and 6 minutes from Salem College. For nearby shopping, we are an easy 8-minute drive from Hanes Mall, and for sports enthusiasts, we are just 2 minutes from BB&T Ballpark, and 14 minutes from the Sara Lee Soccer Complex. If you have come to Winston-Salem NC for the abundant culture and arts, Hawthorn Inn & Conference Center is 1 minute from the Milton Rhodes Center for the Arts, 2 minutes from the Sawtooth Center, and 3 minutes from The Stevens Center. 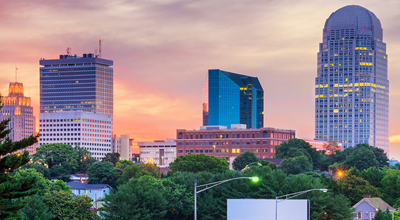 Winston-Salem North Carolina offers a seemingly endless array of attractions, wineries, world-class restaurants, as well as a wide variety of live theater, arts, ballet, and concerts featuring top name artists. The city of High Point that is located in the Piedmont region of North Carolina is 19 miles from Hawthorne Inn & Conference Center, and the town of Friendship is 23 miles from the hotel. The nearest airport is Piedmont Triad International Airport, which is 23 miles, or 25 minutes away from the hotel.